It is posted on Patchwork Posse!!!! I can show the quilt! See below! Becky Jorgensen is the owner and chose me to be one of her guest designer this year. June is MY month to be featured on her blog. I was asked to design a pattern for the members of herIAQ.com group. You can find it through. Patchwork posse.com The pattern is available for free only to the members. It is a very educational blog and group with a ton of resources! You can listen to my interview with Becky and read a bit about me and my business on the blog. The quilt below is what I designed for the event! I love showing off fabrics in simple pieced blocks. I think “Won’t You Be…” Quilt does just that. I hope you will go take a look and enjoy! Thanks for following me in my quilting journey! Now On to two tips . . . There is a sashing (grass) between the houses rows. 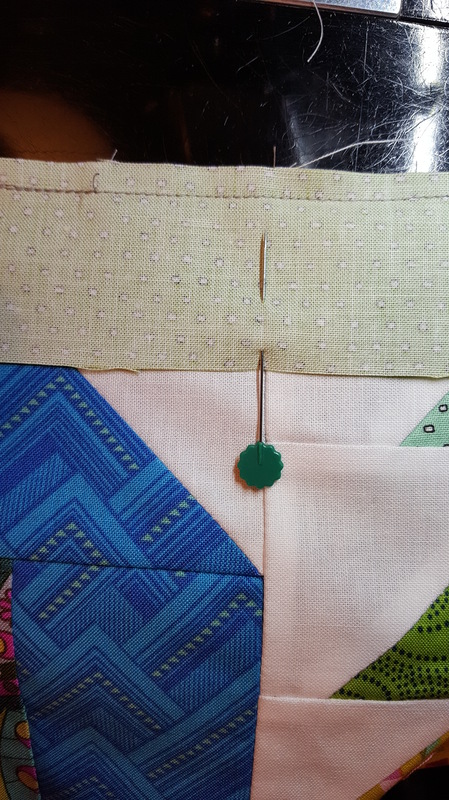 To make sure the blocks line up vertically in the quilt, I am careful to align the seams. I place a pin at all the block seams before I add the next row of houses. Then, you can easily see where to line up the row! Photo is of pin on seam. The next row is added above the sashing in this photo. #1- Mark sashing with pins before it is pressed to easily find where to line up the next row. Marking seam line with pin. It is easier to work with the quilt in two halves. Then sew the two halves together. If you start at the top and work all the way down, you are dealing with most of the weight of the quilt for the last several seams. So, by doing each half, you only are working with the full weight once for the center seam of the quilt! The photo of the sashing is at the top of a row. I worked from the bottom up for the second half of the quilt. Then I sewed the two halves to make the whole! #2- Work with a quilt in sections. As described above, I sewed each half of the quilt. Then into whole center! This helps to deal with less weight until the final center seam! 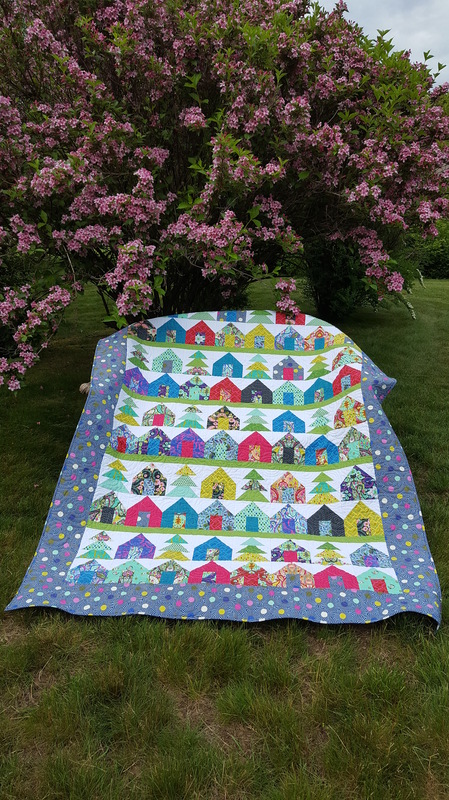 This entry was posted in fabric, guest designer, Piecing, Uncategorized. Bookmark the permalink.